Liquid City documents the collaboration between Iain Sinclair and photographer Marc Atkins and their eccentric, manic, often moving explorations of London’s hidden streets, cemeteries, canals, parks, pubs and personalities. Consisting of striking, atmospheric photographs by Atkins, including many new additions, and with a new introduction by Sinclair, the book focuses on London’s eastern and southeastern quadrants. 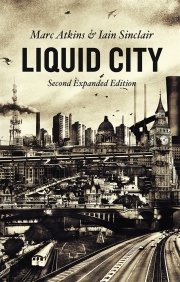 An array of famous and lesser-known writers, booksellers and film-makers slip in and out of Sinclair’s annotations, as do memories and remnants of the East End’s criminal mobs, as well as physical landmarks as diverse as the Thames Barrier and Karl Marx’s grave in Highgate Cemetery. Iain Sinclair is known for his dense, impressionistic, psychogeographical formulations of London in books such as London Overground: A Day's Walk around the Ginger Line (2015), and London Orbital (2002).|Marc Atkins is a freelance photographer whose work has been exhibited across Europe and North America, and published in books and magazines worldwide.|Marc Atkins is a freelance photographer whose work has been exhibited across Europe and North America, and published in books and magazines worldwide.